Hare Krishna Hare Krishna Krishna Krishna Hare Hare Hare Rama Hare Rama Rama Rama Hare Hare - Simply repeating this 32 syllable name of God is said to be sufficient to destroy all ignorance and bring one back to the lap of the Divine. 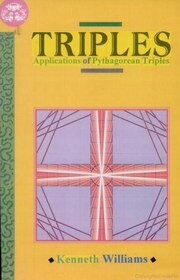 Pythagorean triples, like 3,4,5 have been a fascination for thousands of years. Now for the first time a simple elegant system, based on these triples, has been developed which reveals unexpected applications in many areas of pure and applied mathematics. Since the publication of the book "Vedic Mathematics" by Sri Bharati Krishna Tirthaji, many new applications of the Vedic system have been found. Vedic Mathematics contains many examples of striking methods of calculation and there is a remarkable coherence to the system which makes it very attractive. Astronomical Applications of Vedic Mathematics is a self-contained book which shows Vedic Mathematics applications in many areas of Astronomy including Prediction of Eclipses, the Solution of Kepler's Equation (an important equation is astronomy for finding planetary coordinates), solution of Spherical Triangles, Prediction of Planetary Positions. The methods given in this book are not intended to be a complete or thorough treatment of the topics they deal with. All of the ideas can probably be developed further or applied in other areas. An attempt has been made to make the material intelligible to as wide a readership as possible. To this end a Glossary and an Index have been added. An attempt has also been made to make the book as self-contained as possible so that the first chapter introduces some of the Vedic methods of calculation which are used in the book and the fourth chapter introduces the arithmetic for Pythagorean triples which is used in the subsequent chapters.